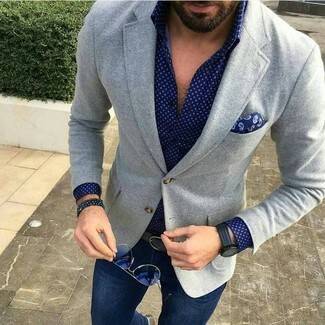 Choose a People Tree navy polka dot long sleeve shirt and black skinny jeans if you're in search of a look idea for when you want to look casually stylish. To bring some extra depth to your ensemble, slip into white leather low top sneakers. 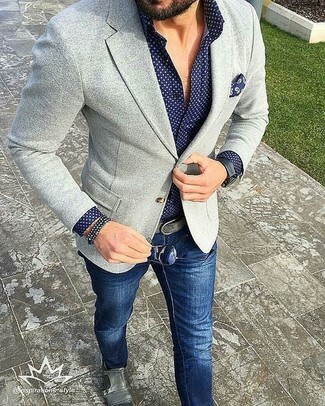 To pull together a relaxed casual ensemble with a fashionable spin, you can easily opt for a navy polka dot long sleeve shirt and white chinos. 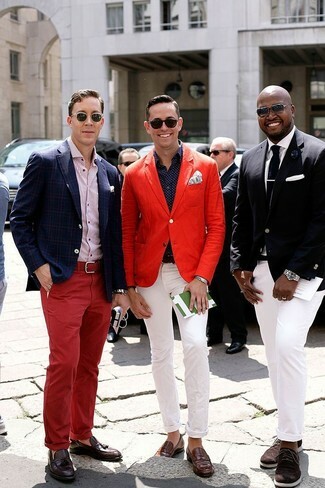 Channel your inner Ryan Gosling and lift up your look with brown leather loafers. 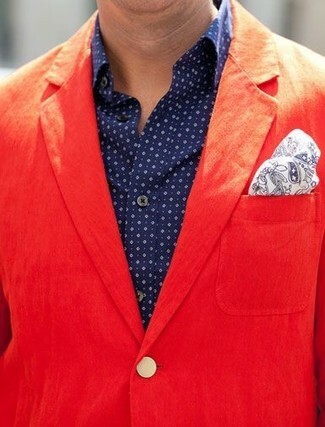 A navy polka dot long sleeve shirt and a red cotton blazer are powerful players in any guy's collection. 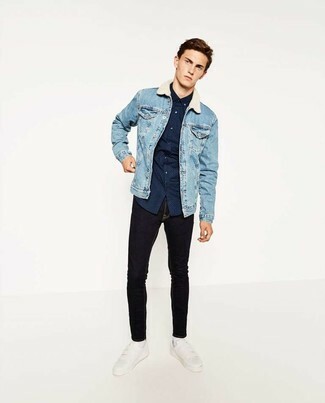 You're looking at the definitive proof that a People Tree Dot Shirt from Asos and black jeans look amazing when matched together in an off-duty ensemble. Loving how well a People Tree Dot Shirt from Asos works with navy jeans. Complement your outfit with white leather low top sneakers et voila, this ensemble is complete. 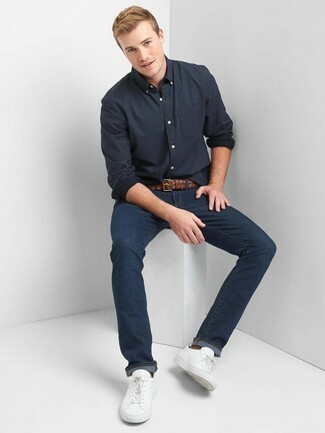 A People Tree Dot Shirt and navy jeans will inject your current styling routine this relaxed and dapper vibe. A pair of grey leather double monks will put a more refined spin on an otherwise everyday ensemble. 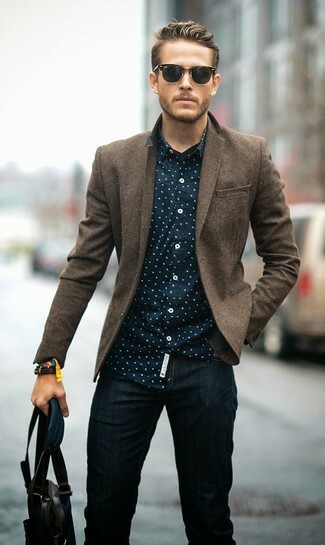 Consider wearing a People Tree Dot Shirt from Asos and olive skinny jeans for equally dapper and easy-to-style outfit. 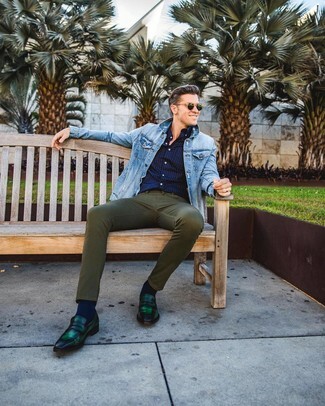 A trendy pair of dark green leather loafers is the most effective way to inject an air of elegance into this outfit. A People Tree Dot Shirt and navy jeans are the kind of a fail-safe off-duty getup that you so terribly need when you have zero time. 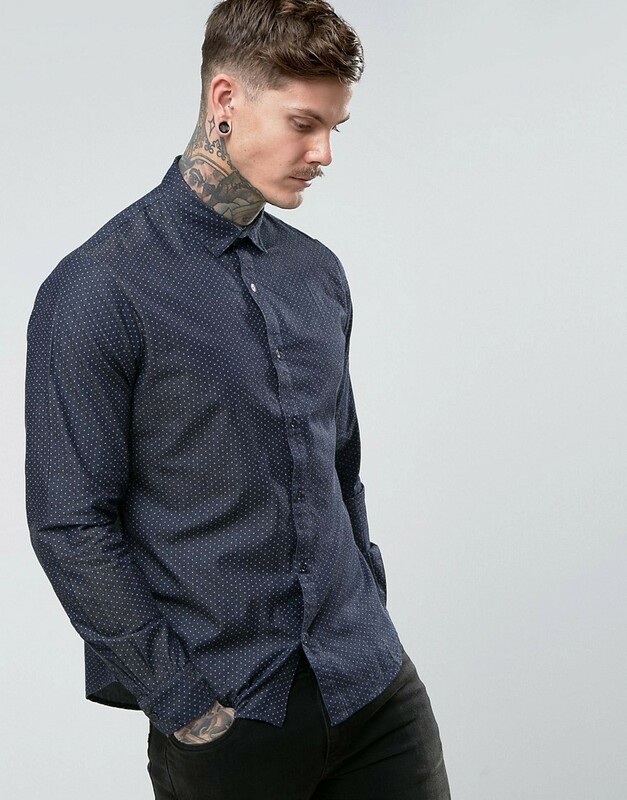 This elegant pairing of a People Tree Dot Shirt from Asos and black dress pants is really a statement-maker. Black leather derby shoes are a guaranteed way to bring an added dose of style to your outfit.